If you are a pencil artist or student, chances are that you have been bothered by graphite shine. But what it is exactly and why so much buzz about it? First of all, graphite shine is an inherent quality of graphite. 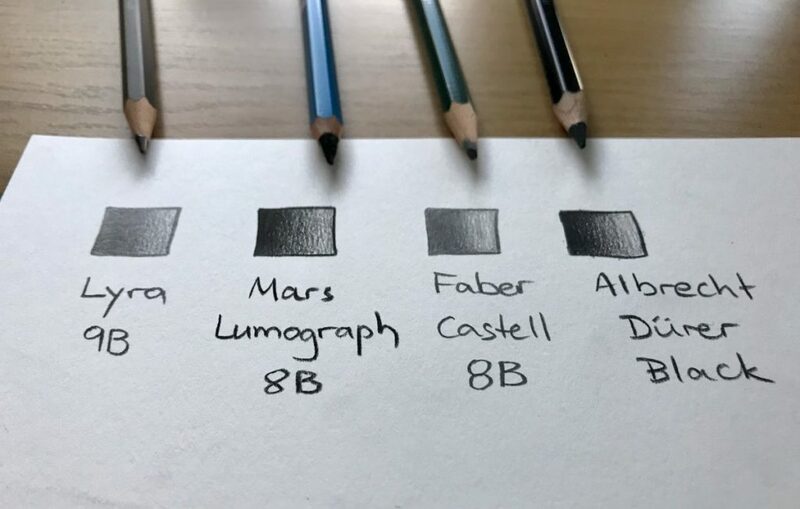 When pressing graphite on paper, dark values can look shiny from an angle, or under certain lighting conditions. So, what we can do to reduce graphite shine? 1. The more graphite we lay down on paper (=the harder we press) and the softer this graphite is, the more shine it creates. So, the most obvious way to reduce graphite shine is … using less graphite! Most artists who are just starting out, avoid dark values for that reason. I, myself, had also such a phase in the past. 2. Mixing graphite with charcoal. 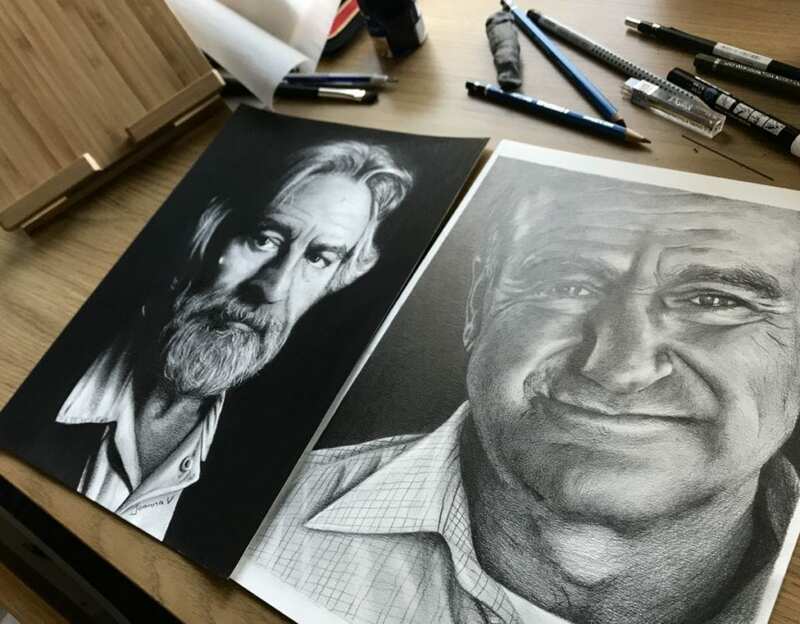 Although I do not like charcoal (it is very messy for my taste) many artists mix the two mediums with incredible results. If, however, you are like me and cannot work with charcoal, I have the next best thing for you! 4. 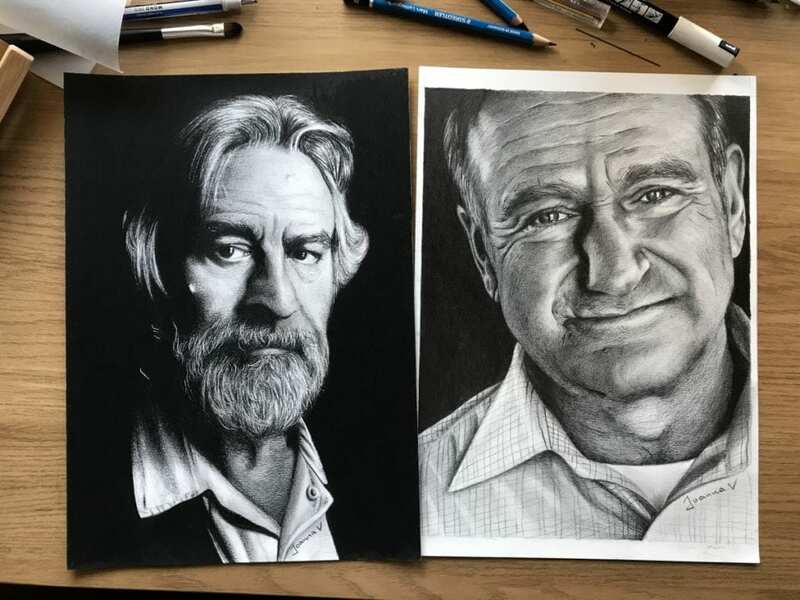 Using a black colored pencil. 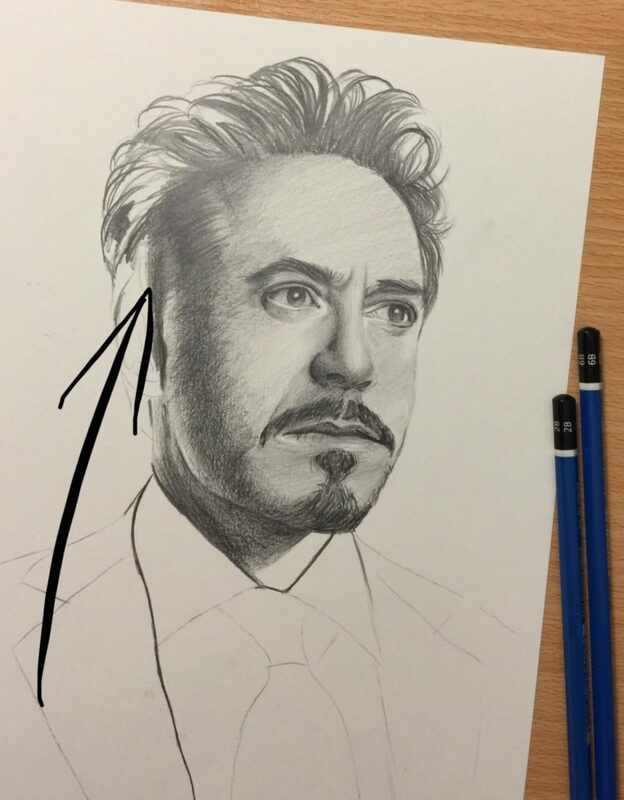 Instead of using a dark graphite pencil, you can use a black colored pencil. My favorite is Faber-Castell albrecht dürer black (no, I am not paid for saying this either!) This Pencil creates pitch black values as well, however it might not work for all. It can be tricky when mixing colored pencils with graphite, because they have different qualities. Graphite is scratchy on paper and colored pencil is like butter, so it needs extra effort to make them work together. There is a Lyra art&design 9B Pencil (which is my favorite dark pencil among the ones WITH “graphite shine”), a staedtler Mars lumograph 8B, a Faber-Castell 8B Pencil and a faber-castell albrecht dürer black colored pencil. Only Mars lumograph and colored pencil stay matte. The same results on actual drawings. 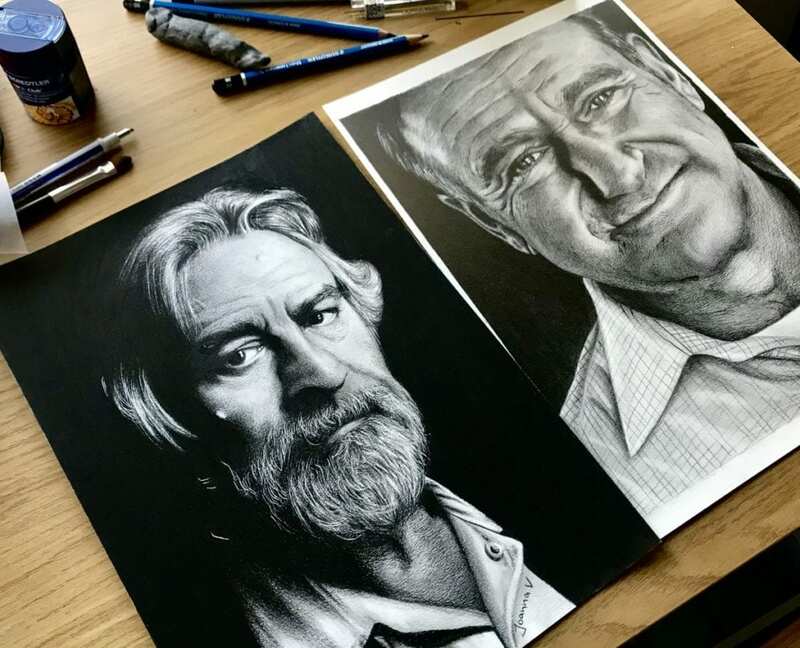 Robert was created with Mars lumograph and Robin with standard graphite pencils. You can see how they look from top, from an angle and from an extreme angle. 5. Make peace with graphite shine. I do not despise graphite shine, I love it sometimes. 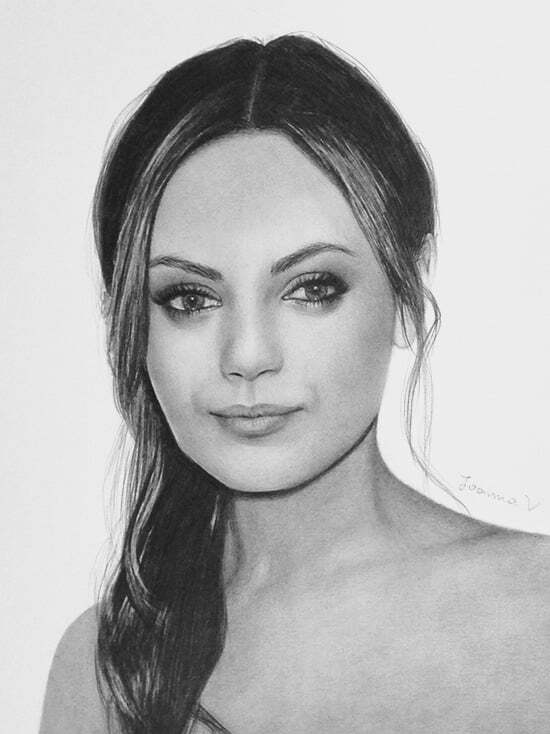 I think it makes your drawing legit. However, you can take an extra step or two, to minimize the shine or to make it look good! A. Use strokes in the same direction, instead of being all over the place. This way your shiny areas will be more uniform. B. Spray your drawing with a mattifying fixative when finished. (which is something you should be doing regardless) Spraying with a fixative helps reducing the shine, and bring out the most of your drawing. I use many brands and love them all, haven’t found my “holy grail” fixative yet, so any recommendations are more than welcome! C. Instead of applying one layer of graphite with super hard pressure, try applying many soft layers. This technique takes away some of the shine, and shiny areas are more uniform. So, what about you guys? How do you deal with graphite shine?